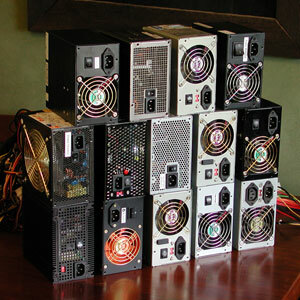 Today we're looking at thirteen power supply units, or PSUs, from various manufacturers. We don't have a particular criteria in mind, we've just been sent a few PSU's over the last little while and it's time to check them all out. As this is the first official PSU roundup on OCAU, we'll be exploring the nature of PSU testing a little as well. I'll save you the standard rhetoric about PSUs being an under-rated (no pun intended) part of the PC. It's pretty clear from the explosion in "luxury" PSU availability over the last couple of years that many consumers do indeed feel the PSU requires some consideration before purchase. Whether they're considering stable power under load, or the quietest possible unit, or simply the one with the brightest LEDs, depends on the person in question. For this reason I hope to bring some products to your attention and compare their features and performance. Unfortunately, PSU testing is not as simple as, say, examining the features of a midtower case or comparing the performance of some CPU coolers. To truly test a PSU you need some fairly specialised equipment and a very intimate understanding of electronics. Given I possess neither of these, there haven't been any PSU reviews from me on OCAU to date, although we have published a few reader-submitted ones. Indeed, a quick look around shows that even the larger review websites seem reluctant to review PSUs as well, possibly for similar reasons to my own, while some smaller sites restrict themselves mostly to listing features, mentioning the reported voltages and ensuring that no flames are emitted from the unit during power-up. Of course, there are some sites that review PSUs in amazing detail, and full credit to them for doing so. However, there are some genuinely interesting PSUs hitting the market lately, and it seems a shame for us to completely ignore them because of a fear of not being able to review them in the absolute maximum detail. So, what I propose to do in this roundup, and future PSU roundups, is to write from my abilities, for my audience. What I mean by this is: I'm a PC enthusiast. OCAU's readership is, for the most part, PC enthusiasts. OCAU's articles are therefore almost always written for (and usually by) them. There are no doubt some talented electronics engineers who read OCAU - to them I apologise in advance, for there will be no oscilloscope graphs and ripple variance diagrams and detailed descriptions of the innards of the PSUs in this article. I will attempt to detail the experience an enthusiast can expect from each of these units, covering the features and package, as well as examining their impact on overclocking. Hopefully this will provide enough of a "real world" picture of each unit to satisfy most of our readers. Your feedback and suggestions are welcome. More +12v capacity, including a second +12v rail if more than 18A is required on 12v. Minimum efficiency of 70% under full/typical load and 60% at light load. The main 20-pin ATX power cable has been replaced by a 24-pin connector, to support PCI-Express requirements. The 4-pin AUX power connector should be on a separate +12v rail. Another change involves a new 6-pin PCI-E power connector that goes direct to the video card, similarly to the 4-pin molex connector seen on high-end AGP cards. It's worth noting that as of now you don't necessarily need an ATX 2.0 compatible PSU, as evidenced by the large number of non ATX 2.0 compatible PSUs still on sale. If you're building a high-end PCI-E based PC, especially using SLi, then I would definitely recommend an ATX 2.0 compatible PSU. However, most PCI-E cards with the 6-pin connector include an adapter from 4-pin molex and not many motherboards require the 24-pin main power cable yet. But if you're looking to future-proof yourself, ATX 2.0 compatability is worth considering. We'll examine ATX 2.0 in more detail in a future article. Behold our tower of power. You may have noticed there's 14 units, not 13. The extra one is a generic "Yum Cha" 300W we'll be torturing. Note that I am in no way disrespecting Asia, Asians or Asian products with this name. I know full well that the vast majority of computer bits come from Asia and a great many of them are excellent quality. "Yum Cha PSU" is simply a common label I often hear applied to generic, unbranded, free-with-case and otherwise unexciting PSUs, so that's all I mean by the name. I didn't specifically name the manufacturer because it's not really fair to single them out this way. So, with no further ado, let's look at the units in detail.